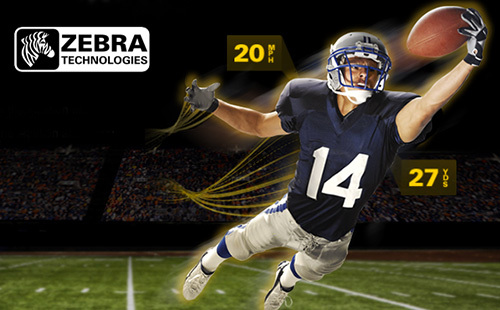 Starting this season, the National Football League plans to use MotionWorks™ created by Zebra Technologies for RFID-enabled data visualization and statistics, focused primarily on their Thursday night football games. The RFID technology will enable the NFL to capture new, unique statistics from position and location-based data. MotionWorks™ will add to the live television experience the ability to display exact player movement paths, as well as velocity, acceleration, distance run, and impact measurements in real-time. The NFL did it’s homework before selecting RFID technology by first experimenting with Bluetooth, GPS and infrared. Most of these technologies would have only allowed for enhancement in post-production of NFL content. Instead, the league was seeking real-time data to enhance it’s fan experience and to gain a better understanding of dynamics in football. We don’t yet know what kind of rule changes or ramifications this could have on the game, but it’s possible MotionWorks data could be used to help determine calls such as ball position or line judgement, as the ball is as easily tracked for speed, velocity and position as any player. It’s worth noting that MotionWorks™ is a 10-year old technology. This is not the result of technological breakthrough so much as creative application. VARs can benefit from this type of thinking. What kind of opportunities exist outside of the traditional places our software and hardware solutions are used? This story was discovered at FastCo. Labs in an article called “The NFL Announces It’s Tracking RFID Chips On Every Player For 2014” by Matt Hartigan (Follow him on Twitter).